The latest in the ongoing saga surrounding the Costa Mesa Police Union targeting Councilmembers Righeimer and Mensinger has resulted in the arrest and pending prosecution of the private investigators who conspired against the Councilmen. Today District Attorney Tony Rackauckas sent the following release announcing the criminal charges. Recent headlines have seen the union call Righeimer’s lawsuit against the firm “political” well now it appears their action were not only abusive but potentially criminal. SANTA ANA – Two private investigators working for a law firm retained by the Costa Mesa Police Officers’ Association (CMPOA) were arrested on charges of committing crimes against two Costa Mesa council members and a competitor attorney. Christopher Joseph Lanzillo, 45, Lake Arrowhead, and Scott Alan Impola, 46, Canyon Lake, are each charged with two felony counts of conspiracy to commit a crime of unlawful use of electronic tracking device, one felony count of false imprisonment by deceit, and one felony count of conspiracy to commit a crime of falsely reporting crime to agency. If convicted, Lanzillo and Impola face a maximum sentence of four years and four months in jail, as well as revocation of their private investigators’ licenses. They are each being held on $25,000 bail and are scheduled to be arraigned at a later date. At the time of the crimes, Lanzillo and Impola are accused of working as private investigators for the former Upland-based law firm of Lackie, Dammeier, McGill, and Ethir (LDME). CMPOA retained LDME to conduct “candidate research,” including surveillance on Costa Mesa city council members, in the months leading up to the November 2012 election. On June 19, 2012, Lanzillo is accused of purchasing a GPS monitoring device using the alias of Robert Teller with Teller Investigations. Between July 25, 2012, and Aug. 22, 2012, Lanzillo and Impola are accused of conspiring together to place a GPS tracking device on the vehicle of Costa Mesa City Councilman Stephen Mensinger without his knowledge or permission. Lanzillo and Impola are accused of using the GPS device to illegally track the location of Councilman Mensinger. On Aug. 22, 2012, Costa Mesa City Councilmen Jim Righeimer and Gary Monahan were at Councilman Monahan’s Skosh Monahan’s restaurant and bar in Costa Mesa. Impola is accused of conducting an operation searching for evidence to use against Councilman Monahan’s political career. Lanzillo is accused of arriving near the restaurant a short time later. Impola and Lanzillo are accused of communicating with each other and LDME Managing Partner Dieter Dammeier by calling on their cell phones and through text messages. At approximately 5:45 p.m., Councilman Righeimer left the restaurant in his vehicle and drove home after he had consumed two non-alcoholic beverages. Lanzillo is accused of calling 911 and falsely reporting that he observed a man stumble out of the location and into a vehicle that matched the description of Councilman Righeimer’s vehicle. Lanzillo is accused of falsely reporting that the vehicle was swerving on the road and that the driver may be under the influence of alcohol or disabled. The Costa Mesa Police Department (CMPD) dispatched an officer to conduct an investigation. Councilman Righeimer was detained outside his home during this investigation for driving under the influence. After administering a sobriety test and not observing any objective symptoms of intoxication, the officer determined that Councilman Righeimer was not under the influence and he was released. It was later determined that Councilman Righeimer did not stumble out of the bar and was not swerving when he drove. Between June 21, 2012, and July 12, 2012, Lanzillo and Impola are accused of conspiring together to place a GPS tracking device on the vehicle of an attorney at a law firm that was a competitor to the LDME firm without the victim’s knowledge or permission. Lanzillo and Impola are accused of using the GPS device to illegally track the location information of the victim. CMPD provided reports and information to the Orange County District Attorney’s Office (OCDA). The OCDA conducted an extensive investigation into all matters surrounding this incident. The investigation is on-going. Senior Deputy District Attorney Robert Mestman of the Special Prosecutions Unit is prosecuting this case. We’re live from OC GOP Central Committee for the first round of endorsements for the November General Election. As is normal for an endorsements meeting, a slew of new alternates are being sworn in (though several represent new ex officio members as this is the first meeting since the Secretary of State certified nominees for the November election). There are so many elected officials and candidates present that I will not even attempt to list them all. Pete Peterson, the Republican nominee for Secretary of State, addresses the Central Committee. Ron Nehring, the Republican nominee for Lieutenant Governor, addresses the Central Committee. 8:02 PM: Chairman Scott Baugh reveals more than $10,000 in union contributions for Lucille Kring despite her signing the nonunion pledge. He makes a scathing speech blasting Kring for breaking her word. If she disagrees with the pledge, she shouldn’t have signed it, Baugh says. Kring attempts to protest, but cannot speak as a nonmember of the Central Committee. Baugh entertains a motion from Tim Whitacre to endorse Tom Tait for Mayor of Anaheim. TJ Fuentes speaks in favor of Tait. He speaks of Tait’s servant leadership, Tait’s grassroots activism and efforts to support the Republican Party. Fuentes speaks of Tait standing by his principles of lower taxes, limited government, kindness, and transparency. Fuentes notes Tait is the OCGOP’s 2013 Local Elected Official of the Year. Alexandria Coronado says the Tait of the past is not the Tait of today. She says he’s given money to Jordan Brandman and Jose F. Moreno. She says Tait is working with unions and was a speaker at a Democratic Party-sponsored event. Fred Whitaker moves the endorsement of Lee Ramos for Costa Mesa City Council. He says Ramos will help unify the city. He says Ramos is the leading conservative candidate for the open seat. Baugh asks how much Ramos has raised, how much his opponents have raised, and if he has endorsements from Righeimer, Mensinger, and Monahan. Ramos says he’s raised about $40,000 while the nearest opponent had $9,100. Ramos does have the endorsements. Desare Ferraro urges delaying this to allow Tony Capitelli to be considered for endorsement. One person pulled the endorsements in Huntington Beach, but there is little debate on the Huntington Beach candidates. There is no debate on Peggy Huang for Yorba Linda City Council. Desare Ferraro objects to the endorsement of Tom Lindsey for the November General Election. She says it would be divisive with the recall going on. Brenda McCune notes she ran against Tom Lindsey in 2010, but she supports his endorsement now. She calls the recall a power grab. She calls Lindsey an independent mind and listener. She calls him a good Republican and family man. Baron Night proposes a substitute motion to go to Endorsements Committee. He cites the recall. Brett Barbre notes the recall is October 7 and general election is November 4. He notes the recall costs $300,000. He says Lindsey is a good Republican. Night’s substitute motion gets 17 votes. There are far more votes against Night’s substitute motion. A debate of parliamentary procedure ensues. By a standing vote, there are 39 votes to endorse Lindsey. 37 were needed. Brett Barbre of Yorba Linda moves to endorse against the recall. Scott Peotter of Newport Beach seconds. Baron Night of Buena Park offers a substitute motion to send it to Endorsements Committee. Tim Whitacre of Santa Ana seconds. Night argues the recall is a local issue. Brenda McCune of Yorba Linda says the people of Yorba Linda want to hear from the party because these issues have gone on for quite some time in Yorba Linda. Scott Baugh speaks of becoming an Assemblyman in the Doris Allen recall. He warns of recalls against Jeff Lalloway, Jim Righeimer, and Deborah Pauly. He warns against recalls for anything other than malfeasance or betrayal of Republican principles. Night withdraws his substitute motion. Peotter notes that Young and Lindsey are following the law and the will of the people. He blasts NIMBYs for launching the recall and says that removing Young and Lindsey should be in a general election, not a recall. Whitacre of Santa Ana helped collect recall signatures in Yorba Linda. He claims that Young and Lindsey received PAC contributions. He claims Mark Schwing and Nancy Rikel are conservatives. Barbre of Yorba Linda says it seems the longer you live in Yorba Linda the more credibility you have. He says he’s lived there for 45 years. He says the recall is the biggest waste of money he’s ever seen. He notes the recall supporters were the same people who opposed making Imperial Highway a city road. He notes there is ballot box zoning in Yorba Linda. He notes that Young and Lindsey voted for densities 35% below the cap imposed by voters. Nancy Rikel attacks Young, Lindsey, and Hernandez. She criticizes the Central Committee for endorsing Lindsey. She blasts Young and Lindsey for supporting the Brea Police contract with Yorba Linda. Disruptive audience members who appear to have been brought by Rikel are cheering for Rikel. Rikel complains that the recall cost more because opponents tried to stand at supermarkets to oppose the recall. Baugh asks Rikel if she’s actually arguing that the taxpayer cost of the recall went up because people opposed the recall. She admits she meant her side’s campaign contribution dollars. Peggy Huang notes that unions spent $80,000 in the 2012 Yorba Linda election. She notes Rikel lost in 2012 and is running in the recall. Dennis White recaps the Brea Police Department versus Orange County Sheriff’s Department contract debate in Yorba Linda. Rikel’s disruptive audience members applaud again. Bill Dunlap speaks about Robert Ming being a public servant who is a state leader. Bill Christiansen speaks on behalf of Darrell Issa that there are two good Republicans running for Fifth District Supervisor. Baron Night says Lisa Bartlett failed to ask for the endorsement in the general though she did ask for the endorsement in the primary. He calls Ming an active supporter of other Republicans, a conservative, and a successful Councilman. Steve Nagel speaks on behalf of Lisa Bartlett. He has served with her on various regional committees. He says she is a hard worker and has been a strong Republican in Dana Point and statewide. He says both Ming and Bartlett are good Republicans. He says both applied for the endorsement in the primary and that should stand. Fred Whitaker notes his long term service to the party. He states he is willing to compare his conservative record against anyone else’s. He notes he led the successful effort to eliminate Council compensation. He notes that Orange unions are paying their employee contributions without raises, the only city in the County with this accomplishment. Deborah Pauly points to Whitaker’s $1,000 campaign contribuition to Democrat Tita Smith for Mayor of Orange. She points to Whitaker’s front yard included a sign in support of Smith. No one makes a motion on Novak. Mark Bucher moves to oppose Measures H, I, J, and K, with a second by Deborah Pauly. Fred Whitaker makes a substitute motion to send all of them to Endorsements Committee, with a second by Baron Night. Whitaker says four conservative school board members voted for Measure K. He says he doesn’t know anything about the other three measures. He wants the Endorsements Committee to vet them. Bucher says it’s a simple question of whether the Republican Party stands for or against higher taxes. There are 24 votes to send the four measures to Endorsements Committee. There are 22 votes against sending the four measures to Endorsements Committee. David Shawver speaks in favor of Measure GG. He says the City of Stanton cut $9 million, have 26 employees left, cut spending on public safety. He says the Register said that Stanton has done a good job. Shawver says only three people have opposed this and they’re not Stanton residents. Mark Bucher says Measure GG is a sales tax for public employees. He says that there are alternatives to higher taxes. If the Republican Party does not oppose higher taxes, the party should fold its tent and go home. Bucher says that sending this to Endorsements Committee will simply result in this coming back to Central Committee. Shawver attacks Wayne Lindholm. Shawver says the City has cut 6 out of 20 officers. He says they’ve cut everything they can. He encourages people to look at his books. He claims only outsiders oppose this tax and that Stanton voters should decide. Jon Fleischman notes Diane Harkey opposes this tax. Fleischman agrees with Bucher that approving this tax hike in Stanton will set a precedent where other cities will turn to higher taxes rather than reducing public employee salaries. Round 1 of endorsements are complete. Round 2 will be considered in September. Mary Young thanks everyone who volunteered for the Party at the OC Fair. There’s also a presentation for the Volunteer of the Month. Mark Bucher says the bills are all paid. Baugh jokingly disputes that. TJ Fuentes welcomes the new ex officio members and reminds them to pay their $25 dues. Captain Emily Sanford, USN (Ret.) thanks the Party members for donations of goods to the troops. She encourages more donations, particularly those of the dental variety. CENTRAL COMMITTEE ADJOURNS AT 9:23 PM. (Costa Mesa, CA) – Campaign finance reports show Lee Ramos far outpacing all other non-incumbents combined in the race to replace termed-out Costa Mesa City Council Member Wendy Leece. Ramos raised more than all non-incumbent candidates combined. The majority of money Ramos raised for his campaign has come from Costa Mesa donors. Having already walked to 75% of the homes in Costa Mesa, the Ramos campaign juggernaut is firmly ahead of all other non-incumbents with both more dollars raised and more homes walked. Subtracting out loans, Ramos has double the cash on hand of all other non-incumbent candidates combined. With loans included, Ramos has triple the cash on hand of all other non-incumbents combined. Of all Costa Mesa candidates in the November elections, only incumbent Mayor Jim Righeimer has outraised Ramos. Subtracting out loans, however, shows Ramos has more cash on hand than even Mayor Righeimer. Mayor Righeimer is running for re-election while Ramos is seeking the seat held by termed-out Council Member Wendy Leece. A resident of Costa Mesa since the age of four, Lee Ramos serves on two Costa Mesa City committees. Ramos and his wife raised their family in Costa Mesa, where he grew businesses, managed companies, and served as an educator. Ramos is a well-respected community leader, having volunteered not only on city committees, but also for the Self-Help Interfaith Program, for the First United Methodist Church, and for the Estancia High School football team. Paid for by Lee Ramos for City Council 2014, ID# 1361842. [Warning, boring legal stuff ahead, but it is important]. Many OC Political readers are familiar with the plight of Costa Mesa Councilmembers Jim Righeimer and Steve Mensinger as they have failed to back down to aggressive (and allegedly dirty) union tactics. For those of you unfamiliar, Righeimer and Mensinger have filed a lawsuit against the police union, the union’s former law firm, and an investigator previously used by the law firm, alleging, among other things, that the defendants have engaged in spying, threats, intimidation, assault, and false reports of criminal activity. Recently, they have alleged that the defendants illegally placed a GPS tracker on Mensinger’s car during the last election. Apparently, the defendants have been stonewalling Righeimer and Mensinger, including the investigator repeatedly asserting his Fifth Amendment right against self-incrimination during his recent deposition as Righeimer and Mensinger are trying to get to the bottom of who is responsible for the tracking, and other purported illegal activities. Enter the defendants’ lawyers for another round of delay. They recently filed what is called an “anti-SLAPP” motion. In a nutshell, an anti-SLAPP motion alleges that Righeimer and Mensinger have violated the defendants’ right of petition or free speech. While enacted for good reasons, sadly many lawyers abuse the process because filing an anti-SLAPP motion automatically stays all discovery, preventing Righeimer and Mensinger from getting important facts and documents. In addition, filing an anti-SLAPP motion early in the case forces the plaintiffs to factually defend their claims, even if the defendants are in possession of the facts and documents needed to proved the case, or risk having the lawsuit dismissed. The defendants’ motion claimed that the principal thrust of the lawsuit is the 911 call that the investigator made against Righeimer, falsely accusing Righeimer of driving drunk. The Court rejected that claim, denied the motion, and held that the main thrust of the action is the false and malicious reports of criminal activity by the investigator as an agent for the other defendants. So what does this mean? It means that for now, Righeimer and Mensinger can continue with their discovery and hopefully find out whether the law firm, the union, or both, were behind these dirty tactics. It also means that the Court did not buy the defendants’ bogus claim that their alleged illegal activities are protected. It also means that Righeimer and Mensinger are as committed as ever to exposing the union and its efforts to shut down any attempts to rein in its power. Righeimer and Mensinger have had their personal lives put under a magnifying glass because of their efforts against unions. They have been followed, falsely accused, illegally tracked, and had their families dragged into the fray. Yet they refuse to be scared or threatened into giving up. We should applaud these men and their families, support them, and look for other leaders like them in our communities to support and get elected to local, state, and federal positions. Only then can we begin to make inroads into the unions’ enormous power over California. While many of us conservatives are still licking our wounds from Tuesday, we get more information about the vile attacks those on the left will resort to in an effort to further tighten their grip on our wallets, our government, and our future. Case in point – Frank Mickadeit reported last week in the Orange County Register about the thuggish tactics that the opposition in Costa Mesa to the City Council majority (now consisting of Jim Righeimer, Gary Monahan, and Steve Mensinger) will use. Many of you will remember the harrowing story a couple of months ago where Righeimer was tailed home from Skosh Monahan’s by Chris Lanzillo, an investigator who worked for a law firm that represented the Costa Mesa police union, as well as many other public employee unions in the state. Lanzillo appears to have made a false police report claiming that Righeimer stumbled out of Skosh Monahan’s and was driving erratically on his way home. The police took the unprecedented step of going to Righeimer’s home and conducting a sobriety test. Righeimer passed with flying colors, since all he had at Skosh’s was a diet coke (he had the receipt to prove it). However, the damage was done as Righeimer’s young daughters had to watch in horror, wondering if their dad was going to be arrested. As if that were not bad enough, Righeimer was not even the investigator’s target. As Mickadeit reports, Lanzillo was hired by someone (he wouldn’t say who) to try to catch Gary Monahan, Skosh’s owner, in a compromising position with a woman who had been sent to entrap Monahan, who is married. The woman appeared to be in her 30s, she wore a low-cut top, and she was flirting with Monahan. Nothing came of the event, but Lanzillo got his “bonus” when Righeimer showed up. The District Attorney is investigating the event, and hopefully the shameless thugs who did this will be revealed and prosecuted. While Lanzillo will not admit who hired him, anyone who does not think it will tie in somehow with the unions, well I have a bridge in Brooklyn I would love to sell you. The plot thickens. To answer Dan Chmielewski, a crime may have been committed by Lanzillo and others. Tony Saavedra reported in the Orange County Register today that county prosecutors are investigating Lanzillo on a “conspiracy to file a false police report” with the possibility of more serious charges to come. The investigation has expanded to include another private investigator who works for Lanzillo. Both men had their houses searched and cell phones, computers, and other electronics were taken for analysis. In addition, prosecutors have a search warrant for the cell phone records of police union lawyer Dieter Dammeier, who has employed both investigators in the past. Saavedra also noted that there is a separate investigation in El Monte, where the former city manager filed a police report last year that said he was followed for days by a car similar to the one Lanzillo owns. Lanzillo would not confirm or deny that he is the one who followed the city manager. Stay tuned as this story does not seem to be going away any time soon. At least one vandal has been caught red-handed. A video, taken by a Mensinger supporter, shows a bearded man pulling up signs for the 3Ms and supporting the proposed city charter, tearing them apart, and tossing them in the bushes. At a candidates’ forum for Atlas PAC last week, McCarthy identified the man as Steve White, a Costa Mesa city employee and member of the Costa Mesa City Employees Association, the union that has sued Costa Mesa over its attempt to outsource union jobs to private companies to save the city money and reduce the city’s unfunded liability for skyrocketing employee compensation and benefits. As the OC Register reported, White has been placed on paid administrative leave and is under investigation, though the city did not say the reason for the investigation. White, classified as a Senior Maintenance Worker, earns approximately $86,000 per year in compensation and benefits (see #382 in the link). Interestingly, though White has a prominent beard in the video, the Register reported that White’s Facebook page showed a recently shaven profile picture. 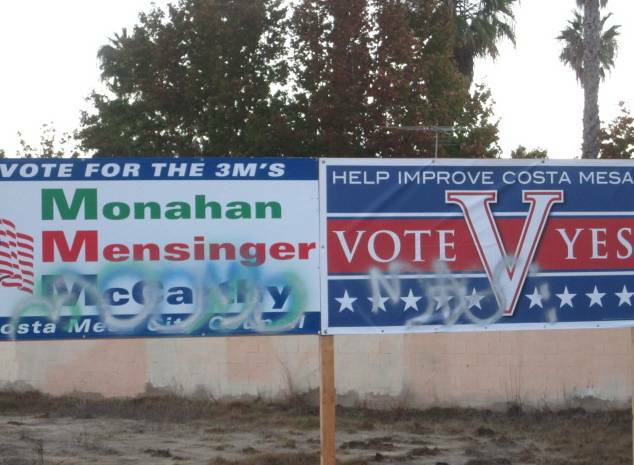 The union has deflected comment about White’s purported actions, stating “Sign damaging is something that has happened in every election,” said Orange County Employee Association spokeswoman Jennifer Muir, who added all sides’ signs have been defaced. “It’s not a good thing. It’s silly. It should stop.” Muir would not comment about White specifically because city administrators have not officially linked him to the signs (don’t hold your breath for any comment after they do link him). However, she did not waste a chance to again attack Mensinger and the council majority, stating “Now they can’t stand the scrutiny to their plan,” she said, “so they’re trying to drum up a political diversion.” Muir apparently was not asked how a union member, making nearly $90,000 a year from the city, destroying the property of the 3Ms – something which the union-supported candidates have also complained about – is a “political diversion” rather than simply a petty act of vandalism. It begs the question of how the union would have responded if one of the 3M’s supporters had been filmed destroying Stephens’, Weitzberg’s, and Genis’ signs. Yes, that was a rhetorical question.